Despite my (irrational) distaste for cupcakes, I have to admit that this is a very cool idea: a double-decker bakery bus! 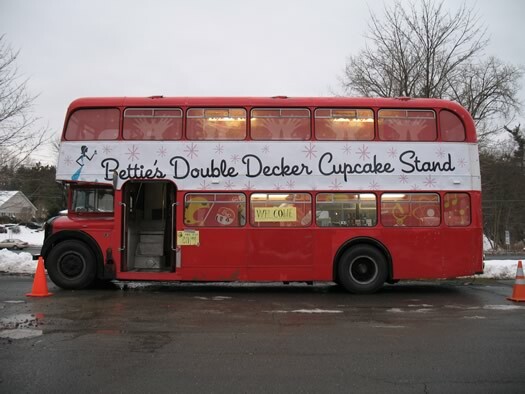 Here’s the deal: Bettie’s Cakes, located in the Downtown Marketplace in Saratoga Springs, is parking their double-decker cupcakery at the Hewitt’s on Western Avenue in Guilderland every day from noon-6, until December 23. From what I understand, the cupcakes are a touch pricey ($2 for a mini? ), but apparently worth every penny. According to Bettie’s website, they offer a few regular everyday flavors (chocolate, vanilla, red velvet, cappuccino, pb cup), and some amazing flavors-of-the-week (most intriguing: tiramisu, cherry cola, and Yeti). I believe a road trip is in order – anyone free Saturday afternoon around 1pm? I will be there, camera in hand, to snap some shots. I’d love some folks to join me! You in? For more photos of this one-of-a-kind mobile eatery, head on over to All Over Albany. Linking to them is the very least I can do for borrowing their photo….thanks, guys. Cupcakes that come to YOU?? I’ve died and gone to heaven!!! I’m forwarding this post to Georgetown Cupcake tout suite! I am willing to roll with you. I still think this would have been better as a 1950s Airstream trailer. Not big on cupcakes but I was happy to see this bus in guilderland this weekend.